Just as we’re waiting on news of another new Nvidia graphics card for our desktop rigs MSI unveils its GE62 Apache-002 sporting a brand new mobile GPU. 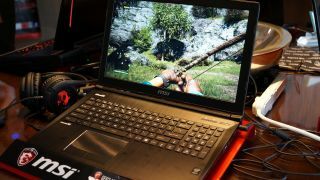 MSI’s 15-inch gaming notebook introduces the new GeForce GTX 965M graphics card with the promise of increased battery life. MSI’s previous GE laptops could barely manage around 2-3 hours of uptime, whereas the new GE62 promises 6 under standard use. We can expect gaming time to be shorter. But with a lower-power Maxwell GPU, potentially in 40-45W territory, we could still be looking at a couple of hours of proper gaming. What we don’t know is what variant of Maxwell we’re getting in the GTX 965M. It could be a cut-down version of the GM 204 used in both the GTX 970M and GTX 980M, or it could be our first look at the GM 206 GPU which is expected to appear on the upcoming GTX 960 desktop card—my guess would be on the older GM 206 GPU, powered by 1,152 or 1,080 CUDA cores. There's definitely a 2GB frame buffer supporting the MSI GE62’s 1080p screen, however. And from the look of that screen it’s a neat little IPS panel, which means wide viewing angles for your gaming pleasure. One of the things I'm most pleased about is the fact MSI have ditched the single, rocking touch-pad button in favour of separate left and right buttons. I know most use an external mouse for gaming on a laptop, but bad track-pads make me want to chew my fingers off nonetheless. MSI is also announcing a GE72 laptop, with a larger screen, with prices for the 15-inch GE62 starting at around $1,300 when it hits the shops.